Pulled Pork and Olive Stew, Thyme for Cooking hearty one dish dinner. I simmered the pork for 75 minutes. It could be simmered longer and/or it could be done in a crock pot. The vegetables are done separately to better gauge how much liquid to add to the finished stew. This should be very thick. Serve with rice, barley or quinoa. This is enough for 2 meals, or 4 servings. Heat oil in a heavy pot or Dutch oven with a tight-fitting lid. Add pork and brown on all sides, about 10 minutes. Add tomatoes, stock, 1 tsp chili powder and bay leaves and bring to a boil. Cover, reduce heat and simmer for 75 minutes. 45 minutes before eating: Chop onion and celery, mince garlic. Cut carrots in half the long way then into slices, 1/8" (.35cm) thick. Heat oil in medium nonstick skillet. Add 1 tsp chili powder, cumin and sauté briefly. Add onion, garlic, celery and carrot, sauté until starting to get tender, about 5 minutes. he pork should have quite a bit of juice by now; remove about 1/2 cup of juice and pour over vegetables. If not, use beef stock. Cover, reduce heat and simmer until vegetables are tender, about 20 minutes longer. Remove pork from pan. Using two forks, pull the meat apart, shredding it into large chunks. 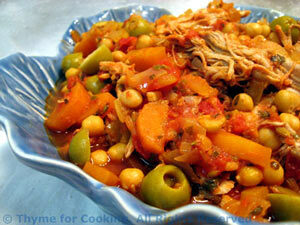 In large bowl combine pork, olives and vegetables. Using a slotted spoon, scoop the tomatoes out of the pork cooking pot. Discard bay leaves. Add as much (or all) of the stock left in the pan to make a thick, moist stew. Serve.